Preparing and training are important. Extremely important. But we tend to do them in an isolated environment – separating the two activities from real-life situations. For example, I have purchased and trained in using weapons for self-defense. Most of my training, however, has been at the shooting range shooting from a standing position at an unmoving target. That’s not likely to be how it will happen in real life, should I ever have the need to protect myself. To remedy that, I’ve taken some “action shooting” training. That brings me closer to real life, offering the opportunity to shoot while moving and shoot from behind cover. Still, it doesn’t bring it into my own life. That’s where “scenario thinking” comes in. Scenario thinking prepares you to defend yourself in situations you are likely to face. In this article, I’m dealing with defending yourself at home. If you have weapons for the purpose of protecting your life and the lives of those you love, invest in training. Not just once, but regularly. To ignore this important step is foolish. At best, it means you’ve simply wasted your money on your weapons. At worst, it puts you in a position of trusting something that you honestly can’t use effectively. After you’ve gotten some practical training, take the next step and imagine yourself using the weapons. Then run through practice drills. Where are you most likely to be at various times throughout the day if a home invasion happens? What is the first thing you’ll do? What is the next thing you’ll do? Where should your self defense equipment (guns or other items) be located? How should they be prepped? What escape routes do you have? What safe places do you have? Where are your telephones for calling 911? If I’m in the basement working, I will grab the gun I have secured near my desk and make sure the safety is off and a round is chambered. Then I’ll look for cover. I have several options identified and will choose based on the noises I am hearing upstairs. Then I will call 911. After that, my actions will be determined by what happens next. This whole scenario is relatively easy to practice and is the best option for me. If I’m upstairs, my actions would be similar to the actions I take in the basement. If not in my bedroom, I would run to that room. Then I would grab a gun and make sure it’s ready to fire. Because our bedroom door doesn’t lock, I have several pieces of relatively lightweight furniture that I can quickly knock over in front of the door. No, they’re not going to stop anyone from entering, but they are going to slow them down and give me more time to prepare. I’m going to call 911. I’m going to address the bad guy using my command voice (from way back in my military days), telling him that I have a gun and I will shoot him. I will tell him I’ve called 911 and he should leave immediately. My actions after that are determined by what happens next, but I’m on the phone with 911 (stay on the line with them – they record all of their calls) and in as safe a place as I can be. Thinking through these situations has helped me define the actions I will take and the order in which I’ll take them. I’ve evaluated and practiced my options before a break-in occurs so that if one does, I’m not in a place where I have to make decisions on the spot under great stress. I’m simply working through the checklist I have in my head. The process has helped me realize that my first instincts weren’t my best options. It has also helped me realize areas of vulnerability. As a result, I’ve repositioned some furniture in my bedroom. It’s helped me identify my equipment needs and where the equipment should be placed. For example, if a break-in occurs while I’m in my chair in the living room, I have little room for retreat. One option is to purchase a glass breaker and place it near our sliding glass door in the kitchen. I may be able to get there safely but not have time to unlock and open the door. The glass breaker solves that and it makes noise that may alert a neighbor. There are other scenarios around your home to consider. 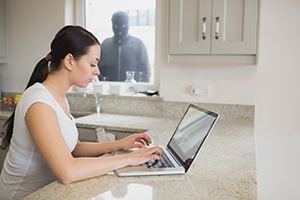 What actions should you take when you hear or see a suspicious person outside your home? Most people are tempted to go check it out. Experts caution against this. Prepare to defend yourself should the person become an intruder, call 911 to have the police check it out, but don’t go “hunting” outside. You don’t know what you’re walking into. Call the police. The statistics in your area may be better or worse than these, but walk around your neighborhood counting houses. When you get to 100, realize that about 15 of them will be burglarized this year. I consider that hitting too close to home to not be prepared. The bottom line – “scenario thinking” is as important as other training you’ll receive. Spend some time thinking through how you’ll react should someone enter your home uninvited. The wife and I have been shooting for over a year now and we’ve gone through a lot of rounds of ammunition. While we were first getting the hang of it, we were going to the range at least once a week to practice. It gets expensive, especially if you’re shooting anything other than a .22. Over the course of that year, not only have we gone through a lot of ammo, we’ve also gone through an ammo shortage. I know that there have been ammo shortages in the past, but this was our first one and it has been a doozy. We’re just starting to see some relief from it in our area. Ammo is starting to line the shelves again, but the price is typically about 25% higher than it was this time last year. What was expensive before is even more expensive now. The bottom line is that we haven’t been able to afford to shoot as often as we’d like. We almost stopped shooting altogether during the worst time of the ammo shortage because we didn’t know when, or even if, we would be able to replace the rounds that we were using. Now we’re shooting just enough to maintain our skills, but not enough to improve them. And like I said earlier, this isn’t the first ammo shortage ever. It’s just OUR first ammo shortage. It has happened before and I can guarantee you that it will happen again. The run on guns and ammo over the past couple of years has swept a massive number of new gun owners into the market. That means increased demand for ammo in the future. One more incident like the Connecticut school shooting that triggered this most recent shortage could put us out of commission for a long time. I don’t like that. I don’t like being at the mercy of market forces. I like being the captain of my own ship. I’ve given the problem a lot of thought and it seems to me that the best way around this situation is reloading your own ammo. Yeah, I know. It wasn’t appealing to me at first either, but the idea is growing on me. I’ve wrestled with my objections to reloading and thought you might benefit from the results of that wrestling. It’s dangerous. 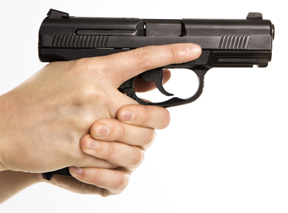 Gun owners hear a lot of bogus, uninformed safety concerns from non-gun owners. 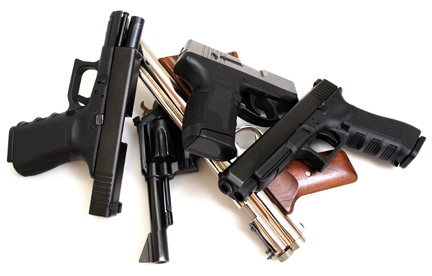 We know that guns are inherently dangerous, but there is a correct and safe way to handle, use, and store them. Surprisingly, there is a large number of gun owners who have the same kinds of uninformed concerns about reloading. “You’ll blow up your house!” As it turns out, that’s not the case. The smokeless gunpowder that is used in handgun and rifle ammunition is flammable, but not explosive. I’ve got a lot of other flammable things in my house right now and I’ve managed to not destroy anything so far. 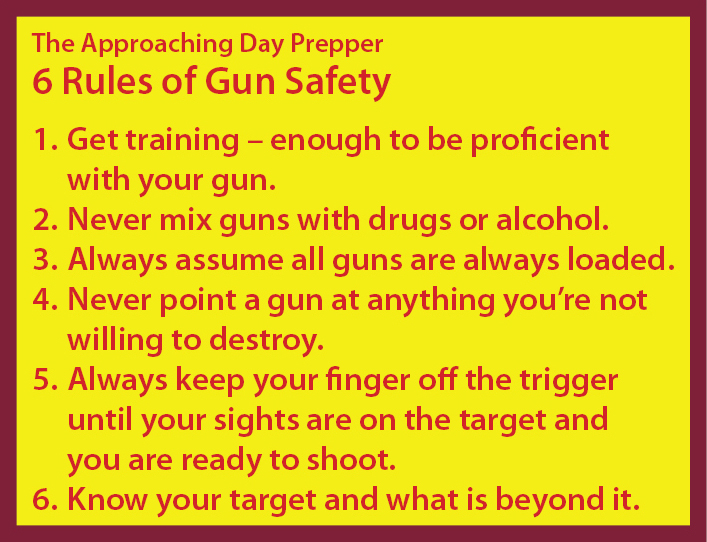 Be diligent and careful with the storage and usage of reloading components and you’ll be OK. “Your gun will explode in your hand!” Not if you following the instructions in your reloading manual and exercise proper quality control during the manufacturing process. Gun owners place blind faith and confidence in the factory ammo they buy off the shelf. Why not have the same (or greater) degree of confidence in ammo that you have made yourself and have carefully inspected through every stage of the manufacturing process? Learn about it before you do it, of course, and then do it with care. My insurance company will freak. This was Sandy’s major concern. Is this OK with our homeowner’s insurance or would they deny a claim because of it? (Because yes, she hasn’t completely gotten over the “We’ll blow up the house” concern, although she admits she has no rational reason to feel that way.) We’re with USAA. They’re a company that only insures military, ex-military, and their dependents. USAA is fine with it, up to me having as much as 20 pounds of gunpowder in the house. That’s enough to load 20,000 rounds of 9mm. I’m good with that. But check with your insurer to see what they say. Your mileage may vary. It’s expensive to get started. Maybe. You can go high-end, low-end, or something in between. I recommend the middle path for most beginners. But even with that, there’s still a considerable cash outlay to get equipped properly. You’ll need a reloading press of some sort and a set of dies for each caliber that you want to reload. You’ll have to have a powder measure that reliably dispenses gunpowder in the desired quantity. And calipers (preferably digital) for measuring case lengths and overall cartridge lengths. 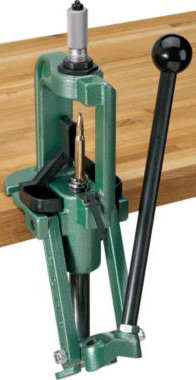 Don’t forget a sturdy workbench to do your reloading on. And storage units that lock to keep your supplies away from children. All of this before we get to the actual reloading components of brass, primers, powder, and bullets. 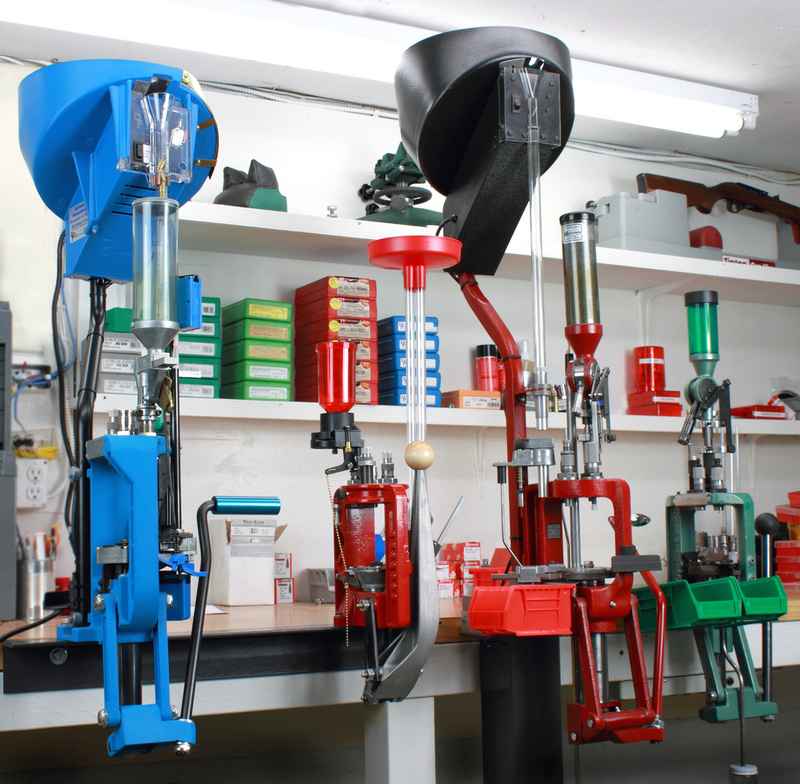 Some reloading manufacturers offer beginner’s kits that have a press and most of the tools that you’ll need to get started. The kits are attractively priced and they offer one-stop shopping, but most buyers have complained that some of the items bundled in these kits aren’t adequate for their purposes, so they had to buy replacements for them, negating the “good deal” they got on the kit purchase. 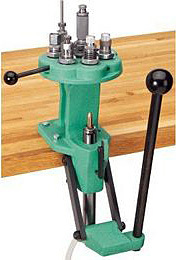 I haven’t bought my reloading rig yet, but I’ve got all of my desired bits and pieces wish-listed on Amazon, ready to go when I get the cash together. I may go through my list in a subsequent blog, but for now all you need to know is that I’m looking at a bottom line of about $600 to buy all the equipment that I’ll want to get started with reloading. About the same amount of money as a moderately-priced handgun or rifle. You can go considerably cheaper and get in for about $200 or considerably higher and be looking at a couple of thousand dollars. I agree, it is a bit expensive to get started, but people do it because it’s cheaper than buying new ammo all the time. I primarily shoot 9mm handguns. My standard factory ammo is CCI Blazer Brass. To buy 1,000 rounds of this stuff (if you can find and buy that much right now) is in the neighborhood of $300 – $380. I just priced the components needed to reload 1,000 rounds of 9mm using my own once-fired brass that I’ve collected after my practice sessions. Buying primers, powder, and bullets to reload 1,000 rounds of 9mm would cost me $143. I would save about $200 over buying new factory ammo. All it would take to make up my initial equipment investment is 3,000 rounds of 9mm. It’s even better with some other calibers. I don’t have an AR-15 that shoots .223 or .308, so I’ve never bothered to price the savings from reloading those rifle calibers, but I’ve seen many postings on blogs and forums that say the savings on those are much deeper than for 9mm handgun rounds. So yes, it can be a bit spendy to get started, but if you want to have a stash that will get you through another ammo shortage, this is the cheap way to do it. It’s complicated. It can be, but doesn’t have to be. Consider this — a lot of people who aren’t as smart as you have been reloading their own ammo safely and successfully for a very long time. Start with a simple press and work your way up to more sophisticated equipment over time. Your investment in basic equipment won’t be wasted. You’ll either want to hang onto it for any of a multitude of good reasons, or you can sell it for almost what you bought it for. 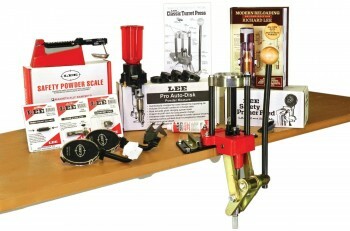 Resale values on reloading equipment are high. I’ve overcome all of my original objections to reloading and am ready to take the plunge. As with all significant new endeavors, I’ve studied the topic a lot and have formulated some opinions about how to begin, which I’ll share with you in later postings. In the meantime, we’d love to hear from any of you who are currently reloading, considering reloading, or still have objections to reloading. Leave a comment below this blog or on our facebook page.